Charleston antique brass floor register available in sizes 4x10, 4x12, 4x14 and 6x10. This decorative vent cover is rated to hold up to 200 pounds. Purchasing the Charleston floor register today! Beautiful Charleston floor register features an organic floral pattern. The steel core faceplate of the black floor vent cover is rated to hold up to 200 pounds. Decorative floor register sold in sizes 4x10 and 4x12. The Charleston floor registers have a unique floral design that sets them apart from other metal floor vents on the market. The oil rubbed bronze register covers are sold in sizes 4x10, 4x12, 4x14 and 6x10. Unique Charleston decorative floor registers in a beautiful polished brass finish. The Accord Ventilation floor registers are available in sizes 4x10 and 4x12. Hard-to-find satin nickel floor register in a floral, scroll design. These Charleston floor registers by Accord Ventilation are an affordable and durable option for your home. Decorative floor registers sold in 4x10, 4x12, 4x14 and 6x10 sizes. This handsome wrought iron floor register by Zoroufy will help to bring out the rich, architectural detail of other wrought iron hardware in your home. Looking for a unique floor register? This Zoroufy antique brass decorative floor register will surely make a fashion statement on your floors! This decorative pewter register by Zoroufy adds a touch of style to rooms. Will look great with your other pewter or soft silver accent pieces. This Zoroufy polished brass decorative floor register has a clear lacquer coat to resist tarnishing. Sharp looking Zoroufy scroll design, antique black floor registers will blend in nicely with any style room. Intricate Zoroufy scroll design floor registers have an antique brass finish. Comes with adjustable metal damper for air flow control. 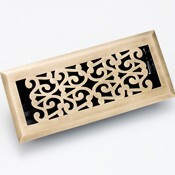 Zoroufy scroll design, antique pewter floor registers add a special touch to your home's interior. Zoroufy scroll design, polished brass floor registers have been cast from 100% brass.